Regardless of whether you’re the one about to absorb the spotlight, being backstage before a runway show is a huge rush. 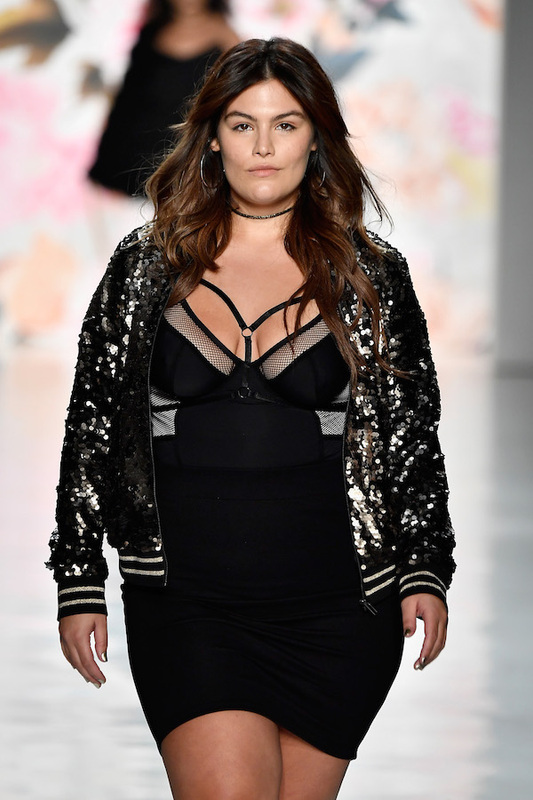 So, when I ventured backstage at New York Fashion Week to interview Torrid’s 2017 model search winner Maria Gimena, it felt like jumping into a whirlpool of stylists, models, and photographers. The energy felt fitting for fashion week and all of the buzz that comes with it. Yet, somehow, Gimena remained calm amid a sea of people. I first interviewed Gimena back in winter right after she was announced as the 2017 face of Torrid, during which she shared her excitement to jump into the new role. So when I found out I’d have a chance to follow up with her during Torrid’s decadent runway show, it felt ideal. During our interview, Gimena told HelloGiggles what it feels like to walk the runway, and how she thinks fashion can be a centering art form. HelloGiggles: Have you ever attended New York Fashion Week as an audience member? Maria Gimena: I attended Fashion Week four years ago as a makeup artist. I was assisting and getting water and running errands — it was a totally different experience. Now, to be on the runway is amazing. HG: Is your family here? MG: No, they had tickets to come, but they had to stay home. But I know they’re watching online, so it’s okay! HG: Did you get to see any other shows at fashion week? Do you have any favorites? MG: I saw Addition Elle and I really liked this red sweater dress from the Jordyn Woods collection that they did together. There was a skirt with ruffles in the back and I loved that look and everything Torrid, of course. HG: What are your favorite pieces in the Torrid collection? MG: The bodysuit that I have on, of course, and the sequins and different textures that we have. HG: Do you think that Torrid’s inclusion in New York Fashion Week signifies a shift toward inclusion in the fashion world? MG: I definitely think there needs to be more diversity in the fashion world in terms of skin color, sizes as well as sexual backgrounds. I think Torrid has done a really good job with being inclusive and I love that, I think that’s where the fashion world needs to go — more women, more diversity, we’re all beautiful in different ways. HG: Do you think fashion is a good tool for healing and centering on an individual level? MG: It can definitely be a form of healing as well as a form of distraction. To me, fashion is art, and just like any other art, you express yourself through it. So, the design of a jacket could be someone’s healing in that design and how it came about. It’s also a form to brighten yourself up, maybe you wear bright colors because you don’t feel bright inside. Or, for me, I love wearing black because in my life there’s crazy stuff going on and in my surroundings, so it makes me feel calm. We look forward to seeing more of Maria on the runway.